That’s why I came up with these breakfast cookies — they have all the sort of good-for-you stuff you’d expect from a breakfast cookie, like fruit, oats, and almond butter. But, for a bit of indulgence and a caffeine jolt, they also have chocolate-covered espresso beans. Preheat the oven to 425 F. Beat together the wet ingredients. In a separate bowl, mix the dry ingredients (except for the raisins and espresso beans). Add the dry ingredients to the wet, and beat until incorporated. Fold in the raisins and espresso beans. Use a 1/4 cup measure to scoop the dough onto a baking sheet that’s been greased or lined with parchment or a silicone mat. Bake approximately 8 minutes, or until tops start to brown. Cool on a wire rack. What's your favorite delicious, nutritious make ahead breakfast? Wonderful recipe! I have oatmeal most mornings, with peanut butter on top for protein to keep me going till lunch. I will try this 'cookie', with added nuts or PB on top. Thanks! somehow these came out completely tasteless. Followed the recipe, I used chunky but not really sweet applesauce, added raisins and nuts, and somehow they are just tasteless. Didnt use an entire tablespoonn of sugar, could that have made such a big difference? Made these tonight with my 2 1/2 year old -- we both realy liked them. ("Cookies" are an easy sell, even if they are healthy). Based on the consistency, I think you could spread these into a cake pan (thinly), bake, and then cut into "bars" to get something more like commercial breakfast bars. The cinnamon made the taste, btw. And smelled wonderful cooking. I made these and they were wonderful. I used a little more oatmeal and 2 egg whites to help bind. I also added a handful of choc. chips to give it a little extra sweetness. My son is allergic to egg, so we usually use flax as an egg replacer with WONDERFUL results. let sit for a little bit. This equals one egg. I have not tried your recipe yet, but it looks great! And these would be a great way to have breakfast or snacks while on vacation without having to pay for a restaurant! :) Thanks!! Is the egg a substitute for the banana? I'm not a fan of bananas mixed in with other foods, but I really like the idea of it being a flourless cookie. Just wanted to let you know that I tried the original recipe and liked it. Sort of like individual banana bread but not quite. I know I'll be baking these often. Thanks! Like you I noticed how full of fat and sugar all the other recipes for breakfast cookies tend to be. I wanted something healthier for my finicky, non-breakfast loving kids. This is perfect! Thanks! I am really late in finding this recipe. I hate (HATE) breakfast but my physical therapist insists that if I don't eat it, my body will go into starvation mode and start storing fat. (You'd think after 57 years my body would figure out that it's going to get fed eventually) Anyway, I tried the Quaker Oats breakfast cookies and they were just yuck so I searched the Internet and found you. I have a batch in the oven as I type this and I must say they do smell good. Changes to basic: Added an egg and some salt, used dried pineapple and brown sugar and 1/2 cup coarsly chopped pecans. Yield 24 cookies - is that about right? These turned out great tasting. Won't have a problem eating one or two with my coffee in the morning. Does anybody remember Bill Cosby rationalizing feeding his kids chocolate cake for breakfast because it had eggs, milk, etc.? That's kind of how these cookies make me feel; like I'm getting away with something. I bet a sweet potato puree in place of the bananas would be yummy! Gotta try that. Ooooo, or maybe even a canned pumpkin puree. The possibilities are endless for this! I love it! I made these cookies but made a few small changes. I was making them for my teenagers who do sports at school and need a breakfast that they can carry for after the morning workout. I added 1/2 tsp of salt and doubled the sugar. Also, my daughter had apparently eaten all of the raisins so I chopped up some dried peaches. They are eating them up. May need another batch for breakfast. Yum! I've heard of breakfast cookies elsewhere but, like you, I've been dissatisfied with the ingredients. This sounds great! I'm going to give it a go next Monday. Thanks! Instead of using rolled oats I often put my oatmeal in the blender and make flour out of it. I use it in place of some of the flour just to bulk up the food value. Thought I'd try doing that in this recipe. I've been looking for a healthy breakfast cookie as I'm not a big fan of breakfast. This one sounds great and I am already thinking of those add ins. Yesterday as I ate an oatmeal cookie, my husband said to me "That's breakfast, not a cookie." Well, why not? The standard cookies wouldn't do, but I wanted to try and see if I could make a healthy breakfast cookie. These were great! I didn't have enough bananas, so I sort of fudged the recipe, but they turned out very yummy. I used dried cherries, blueberry applesauce (because that's what I had, but I think it added a nice touch), sunflower seeds, and old fashioned oats. I added almond butter, but not enough to taste, so I'll use more next time. I'm pregnant and therefore want to eat all the time. These will be a great snack to take to work to stave off the munchies, and convince me that I only need to try ONE of whatever holiday temptation someone has brought in today. I have a batch of these in the oven right now. As I had my children mixing them I had to run out and check on the egg situation. Then I realised that yes, a mashed banana is commonly used as an egg replacement, so with three in it the recipe should be fine. My batch has the cinnamon plus a pinch of cardamom, cranberries, sultanas and toasted almonds. And I used brown sugar for the flavor, like I do with normal porridge. Also I tried out some recipes on this site http://www.applesaucerecipe.org/ and they turned out really well. I just came across this recipe today as I was looking for breakfast cookie recipes. Since I had some going-brown bananas in the house, I decided to make these right away. I discovered I was out of applesauce though, so I replaced it with pureed plums I had in the freezer. Instead of raisins, I used coconut/raisins/golden raisins/dried pineapple. I think they're great! 5-year-old tried a bite and said he'd finish it later, 3-year-old said she didn't like them (no surprise there), 2-year-old is napping and will get to try them after she gets up. As long as more than one of us likes them, they're a keeper! Thanks for the great recipe with so much less sugar than others I found! Making these now, only I didn't have any applesauce so I used canned pureed pumpkin instead. Changed up the seasoning, used some pumpkin pie spice instead of cinnamon. Think they'll come out ok? i am in need of something healthy for breakfast for my school girl :) sounds like a pretty good recipe~ thanks! I made these GF with a trail mix, flax seeds, and frosted rice flakes. I left out the sweetener. They were fabulous! I will be making another batch for next week. I am so happy I found this recipe. A co-worker gave me this recipe years ago and I had lost it. Your recipe helped me recreate the previous recipe I had. Thank you! I know that this is a really old post, but it looks like it's still alive so I thought that I would comment. I made these for the first time tonight. I substituted one of the mashed bananas with a 1/3 of a cup of peanut butter and used rice syrup for sweetener. I used raisins and a 1/3 chopped walnuts. I cooked them for 18 minutes and they set up perfectly. My husband loves them. I definitely plan on making a weekly batch and will double my recipe next time! I'm someone who needs a good breakfast in the morning or I just don't feel too well for the rest of the day, but weekdays I never seem to have time. These are perfect! I've tried a number of variations, but think I like the basic one best (minus the sweetener, which I've found I don't need). I use unsweetened soy milk instead of dairy milk. My additions are nutmeg, ginger, a couple of handfuls of walnuts, and some shredded shredded carrots, which I can't really taste but I like the texture they add. I use old fashioned rolled oats and those work just great. I also like them a bit crunchy so bake them for a bit longer so that they're pretty dark brown on the bottom and edges. I also use them as energy snacks throughout the day, and they work great. Thank you so much for this recipe! How many calories does each cookie have? And how many cookies are in a serving? Love this recipe! I just tried it this afternoon, with a few alterations based on what I had on hand. I subbed craisins for raisins, unsweetened almond milk for skim milk, nutmeg for the cinnamon, and used a stevia blend for the sweetner. I also added about a half a cup of chopped pecans. They are delicious and I'm looking forward to further playing with the recipe in the future. Thanks! Hi, I run this recipe, as is, with no changes through the recipe calculator for WW. Mind you, I have not made this recipe but plan to, so I don't know how many cookies this recipe makes, with all this said, the overall recipe has a point value of 46. If you make 10 cookies from batch, that would be 5 points per cookie. If you make 20 cookies from batch, that would be 2 points per cookie. This is what helped me decide this is a great breakfast, or maybe an anytime snack.. Thanks for the recipe. I do apologize, because I figured the recipe with 1/2 cup of chopped walnuts. That is the only change that I made to the recipe when calculating it. I do apologize again for not catching that before I sent the first calculation. The 1/2 cup of chopped walnuts adds 11 points to the overall recipe. So, without the nuts it would be 35 point value for the total recipe. Then just figure it accordingly. 10 cookies would be about 3 points and and 20 cookies would be roughly 1 point value. I felt it was about time I give credit where credit was due! I found your recipe about 3 yrs ago and have used it constantly since that day. Its the perfect grab and go meal for my husband in the morning with his coffee and its easy for me to heat up and eat while i pack kid's lunches and get ready myself. Sometimes its just raisins and crunched nuts, sometimes it's decadent cranberries, white chocolate chips and crushed almonds as a treat. Thank you so much for sharing this, it's been one of my go to recipes for a long time, so eat and tasty. Thank you so very much! I want to try a PB and Chocolate Chip version even if it is less healthy (yes I'm aware it defeats the purpose). Hi, I just made the recipe this morning and I love them. I also made a couple of changes; I used a combination of dried orange flavored cranberries and dried strawberries. Instead of Splenda I used Agave nectar and I added Salba. Thank you for the recipe. I intend to have them at school for my recess break instead of the commercial granola recipe. I meant to say commercial granola Bars. Just made these and they were pretty good. From the picture I guess I expected them to me crunchy, but they were soft when I made them. Are they soft or crunchy when you make them? What do you think I could change if I wanted them to be more crunchy? Just wondering if something is missing from ingredients listed. i made these and mine did not in any way look like the pic posted. Came out the color of banana bread. in addition, i put it in teaspoon clumps onto the greased cookie sheet and they stayed in clumps. next batch i pressed/flattened myself. I just found these on Pinterest and they are exactly what I've been looking for. Thank you!!! How much Fat is added if u use sugar? Good recipe! I made a few changes: added 1 egg and 1 scoop of vanilla protein powder and eliminated the Splenda/sweetener. Cooked for 10 minutes and they are perfect. Thanks! I used steel-cut oats and soy milk. I just used a heaping measuring cup of applesauce and a little above the mark for the milk and let them sit for about 10 minutes to absorb. I also added fresh blueberries and used some mixed dried fruit I had. They turned out really good and were very easy to make. If you make it as a cookie, I think you might be disappointed as we are conditioned to a particular taste in cookies. Instead, how about making them in a 9x13 and cutting them into bars. Like a breakfast bar, you expect a different taste than the sweetness of a cookie. i found this at pinterest...Luckily I have all the ingredients in my pantry. I do love it...its not your traditional cookie and I can see why some are looking for sweetness. I myself omitted the sugar its just don't like sweet very much. I even use unsweetened apple sauce the dried fruits and mashed banana made it just enough sweetness for me. I should have read the rest of the comment because mine came out like balls I should have flatten it... otherwise, I love it healthy cookie and I added some walnuts too! Thanks for sharing! I used coconut milk instead of almond. Is that a big difference because the cookies did not flatten at all. Well I tried this recipe after just reading the comments attached to it on pinterest. So I missed a few ingredients I just used the banana, oats, applesauce, raisins, vanilla and cinnamon. They are actually very good. Just found this recipe (thanks Pinterest) and tried it this morning. Used craisins and added 1 egg, a few additional rolled oats and a little brown sugar. Cooked them approx 18mins so they were dark brown on the undersides and a little crunchy when cooled. My 2yr old has been asking for "cookies" all day - he LOVES them! Will definitely be trying a bar version soon. Nice to have a quick, healthy go-to snack that we all enjoy. THANKS! Am I the only one who didn't like how these turned out??? I found these on Pinterest and made them last night because I had some ripe bananas. I followed the recipe exactly and they came out like rubber. It was gross. I've made these twice already. I only had old fashioned oats and they work just fine. I add fresh blueberries and walnuts and they are soooo good! Thank you so much for this recipe. I freeze them two at a time in little ziploc snack bags, bring 'em to work and eat them after they defrost. My great niece was visiting a few weeks back and she enjoyed them as well (1 and a half year old). Thank you for the recipe! I loved this cookies! Called my mom and told her about them, emailed her the link to your recipe. Sent my friend and her kid home with some, emailed HER the link to your recipe. LOOOOVE giving my kids cookies for breakfast and they love it to. Its helped right now because they are sick and very very picky about what they eat. Thank you so much! Do these cookies need to be kept in the icebox once they are cooked? The recipe is awesome. My 9mo daughter does not eat pureed foods and loves bread because I think she can hold it so well. I made these cookies for her. I omitted the sugar and the raisins (choking hazard, ya know!). She ate an entire cookie. I was so excited. She got her grains and fruit. My husband and I also think they are tasty. Thanks. I also linked your recipe on my fb to share with all my friends. Hi, I was just wondering if you might know the serving size and nutritional info for these cookies? The recipe yielded 23 cookies but probably could've made 24 if I would've proportioned them equally. I also substituted dried cranberries for the raisins. I made these with dried figs and pecans and left out the Splenda. They didn't need any additional sweetening. Delish! Thanks! I added pecans and used coconut milk! These are really tasty and filling! I think next time I will add some shredded coconut too! Made these tonight and they were delicious! I used old fashioned oats because that is what I had and let it sit for a bit. I also added shredded zucchini because I have boat loads of it in my garden right now. YUM! Thanks! DELICIOUS! Just made the first batch of 12. Yum! I added a tbsp of brown sugar but next time will leave out the added sugar. (Trying to eliminate added.) The banana's are sweet enough if you use very ripe ones. My husband said they are mini banana bread bites. Very healthy, delicious recipe. Thank you so much! I made these tonight and my kids loved them, but I have a question. Were they supposed to spread or was i supposed to flatten them some? Mine stayed in the ball. Thanks for insight! Breakfast cookies are wonderful!! I used Old Fashioned oats and UNsweetened apple sauce, threw in some craisins and walnuts. YUM! Thanks!! Hi!! Thanks for this recipe! I havebeen looking for breakfast optinos for my somewhat picky 2 1/2 year old boy. He's a big fan of regular oatmeal raisin cookies, so I figured I would try these :) Just pulled them out of the oven and they smell amazing! I did make 2 small changes: 2 tbs of sugar instead of 1 (figured it would help sell the little one on these), and about 2 tbs of flour. You had mentioned they were softer cookies and I was worried they might crumble all over my living room! I'm interested to know if anyone used fresh cranberries? I have some and need to find something to do with them. Thanks! I used old fashioned oats. I Just let them sit about 10 min and I used vanilla instead of sugar. Turned out yummy! Make them for my Dad who is diabetic but loves his sweets! given the significant net carb-bump that 1 cup of mashed bananas offers, 44g, I would replace that ingredient with the same amount of pumpkin puree, whose net carbs come in at about 8g. It'll also cut the calories. Similar carb savings can be realized by swapping out the oatmeal a combination of sliced almonds + pumpkin seeds ground into a meal with a food processor. I made these yesterday as I am gluten free and I figuered my 15 month old would eat them as well... The flavor is good, but the texture takes some getting used to, because of the way the bananas cook I assume..? I also made them with coconut milk, not sure that changes anything. Also added a tiny bit of brown sugar as the taste wasn't as sweet as i like. Glad I made them though, easy to grab for me and the kiddo when Im racing out the door! I like these! Easy to make and handy to carry along. I recommend greasing the cookie sheet well. I didn't the first time and they stuck real bad. When greased they came right off the sheet. I've used a variety of dried fruit, cherries, pineapple, crasins, and blueberries. All good. The texture is not like a real cookie. It's moist, soft, dense, and chewy. Overall, well worth the effort. I made the original recipe and liked it. I used dried cherries rather than raisins because it is what I had and love. On it's own, it taste somewhat between an oatmeal cookie and an oatmeal breakfast to me, plus banana. I keep them in my freezer and pop them in the microwave. When I want something sweeter I spread nutella on the top and it is very good together. There are a few things I want to try with this in the future. One is to add quinoa for protein. I also want to try it with steel cut oats, and with coconut palm sugar which absorbs into the bloodstream slower. Have you tried any of those in this recipe? Any thoughts? My boyfriend ate five as they cooled, so I'd say they're a hit. The texture is strange- almost rubbery- but they taste great. So much easier than making oatmeal every morning for breakfast! I make these all the time for my toddler for breakfast and he eats them up! It's nice to have a convenient breakfast food that is well balanced and doesn't come in a box. Since he can afford a little extra calories, I use brown sugar instead of sugar or sugar substitute (I've used honey too). I also add about half a tablespoon of butter and a pinch of salt, which goes a really long way. I usually add fresh fruit, like frozen blueberries or chopped up strawberries or even peach. A dash of nutmeg can be nice too. Thanks for a great, flexible recipe! I have them in the oven now. I added flax seed meal and mini chocolate chips- couldn't resist :). Can't wait to see how they turn Out. I have a 15 year old son who is extremely active in sports that he eats all the time. Need to find more healthy snacks that are not processed. I loved this idea and added 2 scoops chocolate protein powder, an extra 1/8 cup applesauce, 1 T coconut oil, and chia seeds. Nom nom nom! 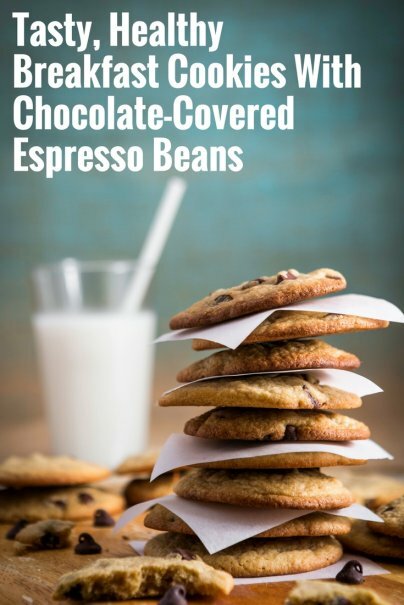 Has anyone tried this recipe with almond milk of any kind. I really don't keep skim milk in the house and always have a supply of almond milk. Also, I am pretty new at using almond milk and I'm not really too sure what recipes I can use it in!!! I love the sound of this recipe but i hate bananas, is there a substitute? I just made these with dried blueberries. Easy! Easy! Easy! I'm embarrassed to say I ate almost half the recipe right out of the oven. Fills you up & sits well on your stomach. Will definitely be making this again. Next time I'll add nuts. Wonder how they would be substituting some peanut butter for some applesauce? Um, folks are all mentioning applesauce in their comments. I'm confused because this recipe doesn't include applesauce. Is it supposed to have applesauce? That may explain why my cookies turned out thick and spongy. These were a big hit with my family. I too made a few modifications. I added fresh grated nutmeg. I did not have espresso beans, so I added some chopped walnuts and mini dark chocolate chips. I baked them in a pan and cut them into bars. Has anyone tried these with substituting the whole wheat flour for GF flour? If so what type of flour did you use? I was planning on using GF Bisquick or GF all purpose.